For those of you out there that cook for a family, do you do his and her dinners? We do a lot of those here (only because I don't eat meat). I like to make sure that the sides I make (for me) are complete nutrition and go well with the main dish I make (for the boys). On this occasion, I ended up being the only one that ate the sides because when the boys got a hold of this pork, they wanted nothing more. The illustrator is a huge fan of smoked pork bbq, but honestly we do it so rarely since it takes so long to prepare. 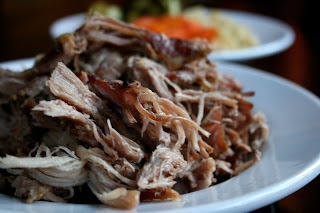 We started thinking about faster ways to cook a pork shoulder and wether it would be as good in the oven as it is in the smoker. We don't normally try new things when people are coming over, but the last time we have a large gathering, we decided to give the oven a try anyway since the pork shoulder was on sale. We are both into food so we talk a lot about flavors and combinations. We did jerk chicken a few weeks ago and the boys LOVED it. So, we decided on jerk pork with black beans and rice. We also did cornbread muffins to bring the whole meal together. Let's just say, not only did this work, everybody talked about the meat for the rest of the night and I was still getting compliments the next day. We have already cooked another one and it is gone! Ladies, if you want to woo your man (and he will think you are a genius) make this for him! You can really add whatever your favorite sauce is to the meat. The preparation is so simple and the meat turns out perfectly! This one was eaten with no sauce and the guys were in heaven. Preheat the oven to 350 degrees. Cut most of the fat layer off of the pork. Coat well with salt, pepper, garlic powder and onion powder. Place the meat fat side up in a roasting pan. Roast uncovered for 2 hours, then cover and roast for another 2 hours or until the meat is 180 degrees and the meat falls off the bone. This cut of meat is very forgiving so 190 degrees is fine too. Serve with whatever sauce you like or let the flavors just shine! i realize this isn't specifically a vegan/veg blog, but this is really the LAST thing i wanted to see here. so gross. shredded animal shoulder. really? Estela, I did that too, but it seemed greasy. In the oven, the outside gets crispy while the inside is still moist. Anonymous, sorry to gross you out, but this is not a vegetarian or vegan blog...this is a dairy free blog. While I don't eat meat, this is how I feed my family. Don't worry about anon ;) Although I'm vegan, I can respect differences in culture and I won't leave criticisms on a blog that I choose to read (and enjoy)! Yum! 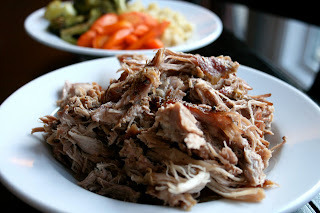 My husband loves pulled pork and I like it too I just don't eat much meat anymore. We really like it with carolina style bbq sauce! Don't worry about anon, they made the choice to read your blog. Sarena, As one of your vegan readers (and friends) I think it stinks that anonymous felt the need to leave that comment. Your blog is your space to post what you want about what you cook. No need to apologize. Also, I love how negative criticism ALWAYS comes from anonymous commenters. Im a vegan too and hey, we all do what we do, and it's our thing and choice and right to post whatever we want on our own blog's. Do your thing girl, even if you or I wouldnt eat it, hey, some people do. Nooch. Well hopefully your bad experience doesnt scare you off for good b/c it's really good in recipes, which i am posting lots tomorrow! This looks good. My husband and I sometimes eat different meals. We almost always do the same sides but the main dish is sometimes different. I just stumbled across your blog and wanted to say hello. As a lactose-intolerant, gluten-free blogger myself, I'm excited to try some of your recipes and ideas. Thanks! wow that looks delicious! i love pulled pork. it's tasty comfort food at its finest!